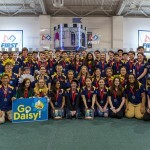 Team 341, Miss Daisy – Team 341 Brings Home the Gold! 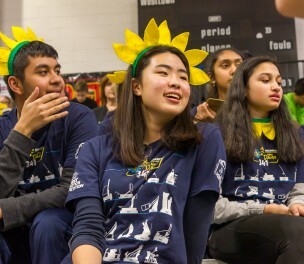 After a solid showing at the Westtown District Competition for Miss Daisy, Team 341 set our sights on an even larger goal: a strong performance at the District Championship at Lehigh University. We went into Practice Day with a host of minor mechanical changes to the robot, as well as more complex integration of programming, sensors, and autonomous modes. Running a miniature crew of students on Thursday, we began to set the stage for our robot. Students and coaches filed in and out of the pit, discussing new strategies and improvements to the robot. Despite missing our only practice match in order to install the changes we brought after Westtown, we spent the rest of our time on the practice field, tuning autonomous modes and practicing shooting boulders from the outer works. Meanwhile, the rest of the team began the process of scouting, with six members watching and documenting practice and qualification matches, and a few others inputting data into our scouting program for 2016. The media team also hurried around, capturing photos and videos documenting the event for promotional use later. Our team participated in qualification matches throughout the latter half of Thursday and all of Friday. We started to settle into clearly defined cycles of crossing defenses, shooting boulders from the batter, and hanging at the end of each match. While we occasionally had to move off of our strategy and shoot from the outer works due to defense, we fought through the challenges and ended up ranking 3rd out of 60 teams at noon on Saturday. 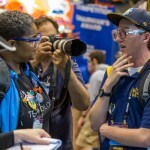 We were overjoyed when we were invited to an alliance with the number 1 seed at the event, Team 225, TechFire! Together, we picked Team 1257, Parallel Universe, during the second round of selections. With everything set to go down in elimination matches, our pit crew toiled away, preparing the robot for the road ahead. 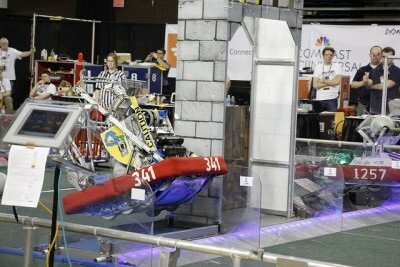 In the quarterfinal matches, our alliance faced stiff defense for the first time during the event. Team 1218, Vulcan Robotics, was the main defender for the number 8 alliance, and set themselves up to block outer works shots with an extended, full height, polycarbonate panel. 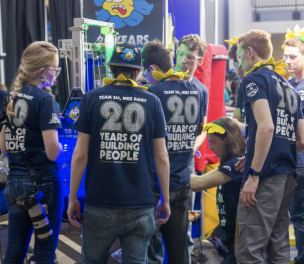 While we went out to our matches specifically to shoot from the batter, and allow TechFire to shoot protected from the outer works, we soon realized that it wouldn’t be successful due to Vulcan Robotics’ excellent blocking. Therefore, Miss Daisy retreated to the outer works for the rest of the elimination matches and drained shot after shot from downtown in the courtyard. In addition, our “lob shot” and servo-actuated extensions at the front of the robot allowed us to shoot over blockers effortlessly. We eventually advanced to the semi-finals, and in one match were able to successfully shoot 7 boulders from the outer works and scale the tower at the end. With TechFire also firing consistently from the outer works and Parallel Universe working hard to defend the opposing alliance in our courtyard, we overcame the stiff competition and moved onto the finals. 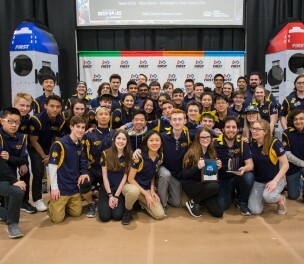 The finals at Lehigh University were electric, as the crowd cheered on the impressive accomplishments of all the teams present. Miss Daisy put up a strong showing, shooting just as many boulders as in the semi-finals and hanging in the last 20 seconds, even with impressive neutral zone defense. 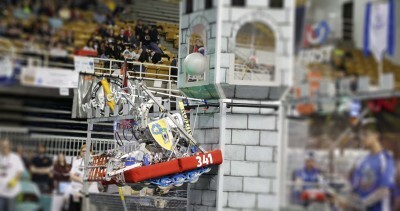 Despite breaking our hanger in match 2 of the finals, our robot continued to sink boulders in the tower during finals match 3. The entire team was in anticipation of the result. An eerie silence fell over the stadium as the scores were announced. The final score for match 3 was posted, and our team roared in applause. We had won, 174-112! Our entire team was ecstatic and humbled by this victory, our team’s first blue banner in 2 years. Overall, the FIRST® Mid-Atlantic District Championship was a great experience for Team 341, and we cannot wait to play in St. Louis next week! Thank you to all of our students, mentors, parents, and sponsors for their hard work and support since January.